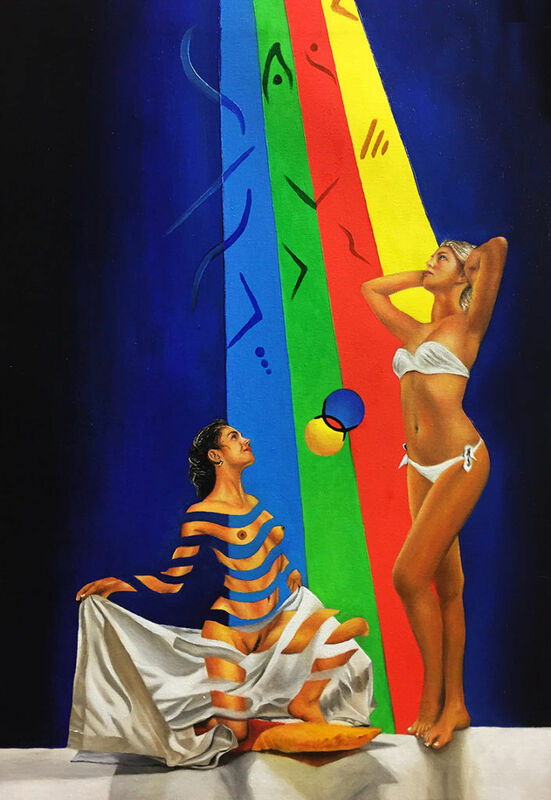 Eva and Giulia – oil on canvas 50×35 cm..
Greet – oil on canvas 60×50 cm. This is the unmistakable style created by Piaia. That represents a unique fusion of languages and currents. 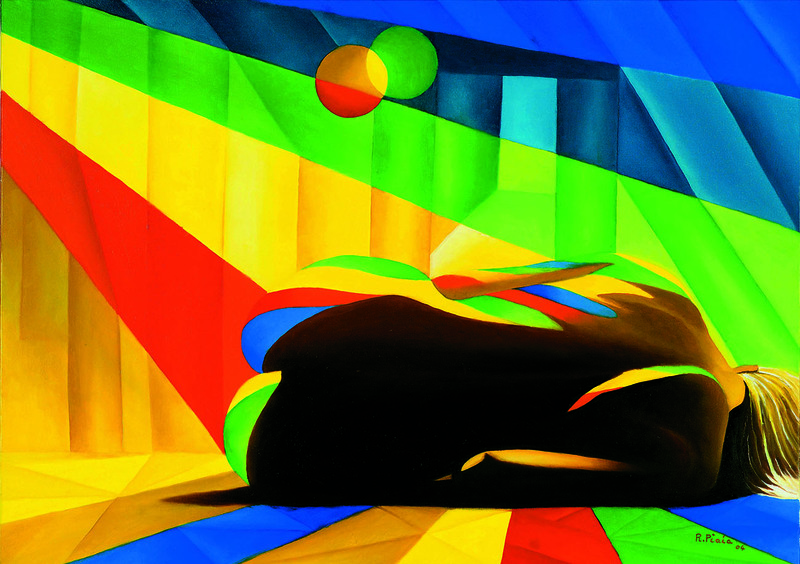 A whirlwind of colors and shapes that converge smoothly and seamlessly, bringing together Abstraction (As), Surrealism (Sur) and classical figuration (Fivo ): Assurfivo. All of Piaia’s paintings are created with a base of pencil sketch and a draft of oil on canvas. 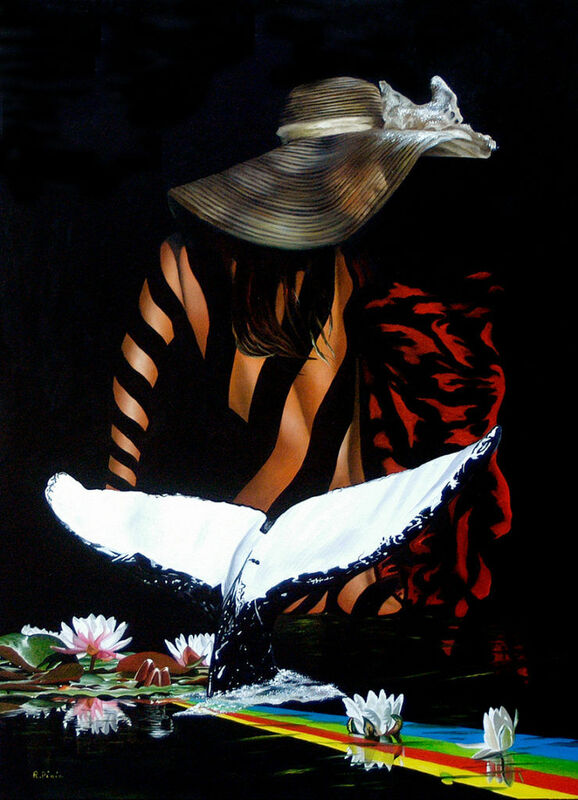 Siren – oil on canvas 70×50 cm. Past Reflections – oil on canvas 50×50 cm. 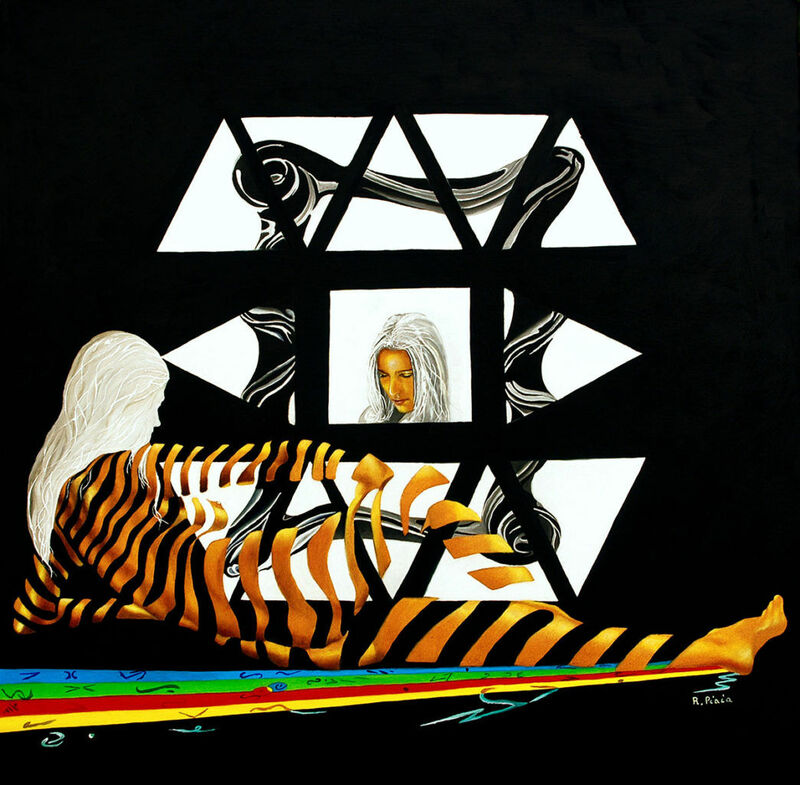 Homage to Elena – oil on canvas 140×70 cm. Roberto Piaia descibes the nuances of our civilization and the influence of history in our time, with the Woman as the protagonist. The Essence – oil on canvas 60×60 cm. Ruhe in Assurfivo – Rest In Assurfivo – oil on canvas 50×70 cm. Since the sound contains the tones of music. 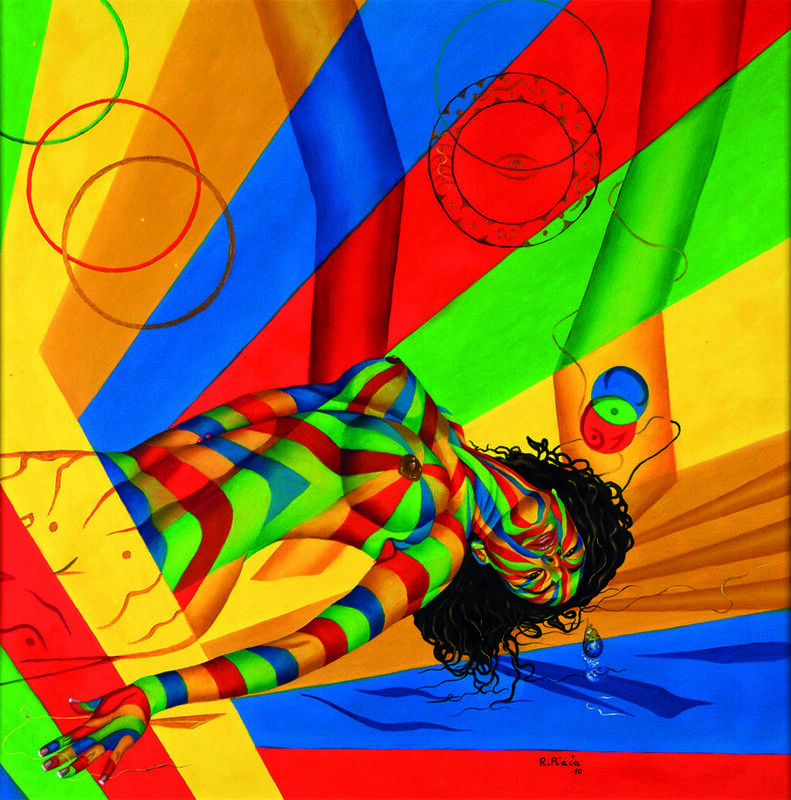 Piaia, through the prism of the mind in many of his works wraps or caresses bodies and objects with colored light. Equal to the light spectrum. 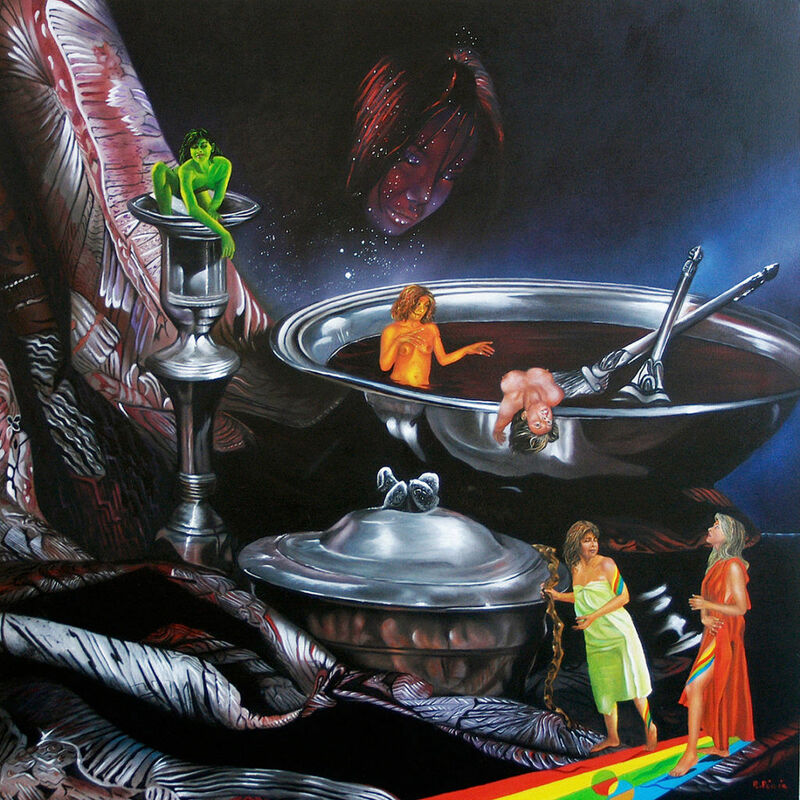 Thoughts of Mary – oil on canvas 100×50 cm. 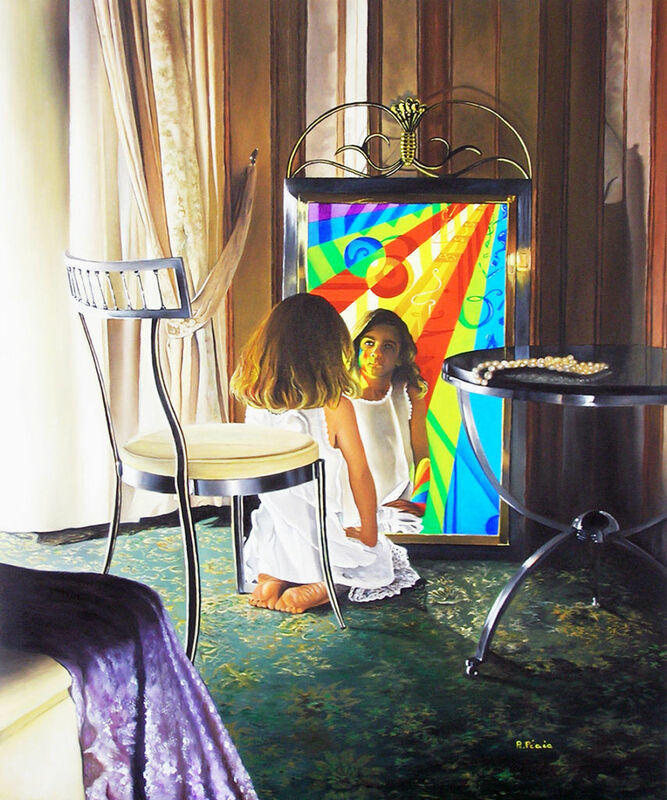 Crystals in an Interior – oil on canvas 150×200 cm. 150×200 cm. Liberty – oil on canvas 70×50 cm. Also in these paintings Interiors are full of minute details. Show close attention to the world. In particular care the care given to the drapes, to crystal glasses, the portraits of scenes of everyday life. All illuminated by the light that surrounds the infinitely small, but also, the infinitely large. Therefore, thus unifying all representations and showing – as well as a remarkable technical mastery – references to the great tradition of painting in the past. 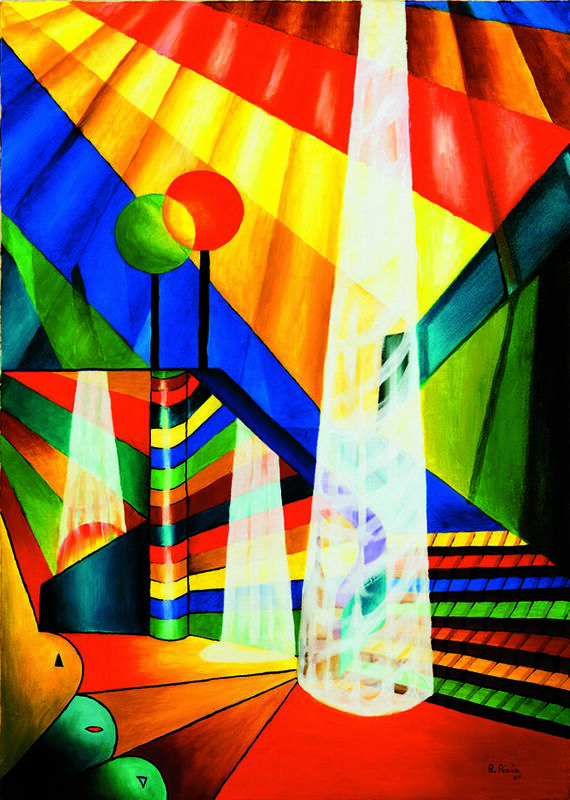 Steps of the Murazzi – oil on canvas 70×50 cm. Lilly – oil on canvas 60×80 cm. The geometrical abstraction represented here is to be considered in a pure, absolute manner. Since the surrealistic element consists above all of the play on words in the titles of the works. Which conjure up moods conveyed through chromatic streaks lacking perspective and clearly shaped and outlined. 1° Canto V – oil on canvas 100×100 cm. “] 2° Canto XXII – oil on canvas 60×60 cm. 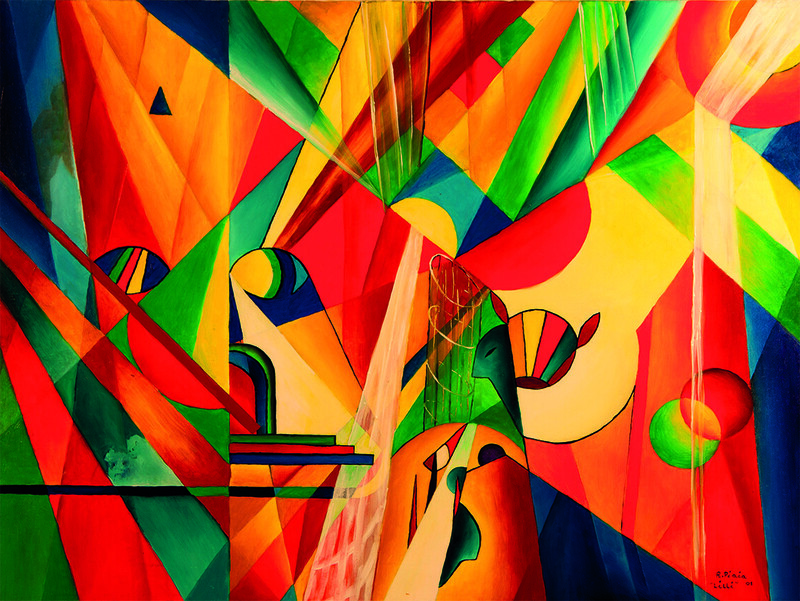 3° Canto XXXIII – oil on canvas 150×50 cm. To illustrate the poetry of Dante’s thrilling journey in the Divine Comedy. The master expressed himself through the creation of an unusual allegory that is entirely feminine. As Women are the main source of inspiration for all his works. February interprets carnival with multi coloured masks… oil on canvas 150×100 cm. April when sleep in so sweet… oil on canvas 100×150 cm. In March is lapped by wild breezes… oil on canvas 150×100 cm. As fa as I know there are not many precedents to this idea of Roberto Piaia’s.Therefore, has dedicated to symbolizing the passage of time with a series of original works. In essence, it represents the same extremely beautiful model, portrayed each time in a different way, based not only on the month. But also on the artist’s poetic imagination.